The SoftBank Vision Fund figures in some of the biggest rounds in the month. Another month, another couple of billion-dollar rounds. Singapore-based Grab raised nearly $1.5 billion from the SoftBank Vision Fund, bringing its total private funding to more than $4.5 billion and valuing the company at around $14 billion. Grab has acquired Uber’s ride-hailing business in Southeast Asia and now competes chiefly with Go-Jek of Indonesia in Thailand and other emerging markets. OneWeb of Arlington, Va., which this year is launching a series of low-orbit satellites for worldwide broadband access, received $1.25 billion in new funding led by SoftBank Group. Grupo Salinas, Qualcomm Technologies, and the government of Rwanda—all existing investors—also participated in the new round. The startup has raised a total of $3.4 billion since early 2015. OneWeb launched its first six satellites near the end of February, with plans to put up 300 satellites by the time it offers its regional broadband service next year. Six hundred satellites will be in orbit when OneWeb launches full service in 2021. The first-generation constellation will have 48 spare satellites. During the month of March, nine other companies pulled in private funding rounds of $100 million or more. Those 11 companies together raised just over $7 billion in total. Alibaba Group, the e-commerce giant of China, is investing about $693 million in STO Express, taking an equity stake of around 14.6% in the delivery and logistics company. Alibaba and STO Express will continue to collaborate on logistics, including last-mile pickup and delivery capabilities, along with new retail business-based deliveries. Beijing-based Horizon Robotics, a developer of artificial intelligence technology and related microchips, received $600 million in Series B funding led by SK China, the China subsidiary of the SK Group, along with SK Hynix, the group’s semiconductor unit. Also participating were several Chinese automotive manufacturers, along with China Oceanwide Capital, Citic Securities’ One-Belt-One-Road Fund, and Minsheng Capital. Horizon Robotics was established three years ago and gained Intel Capital as an investor. The startup has raised a total of more than $700 million in private funding, valuing Horizon at $3 billion and up, according to the company. The SoftBank Vision Fund led an investment of $413 million in India’s Delhivery, joined by Carlyle Group and Fosun Group, existing investors. The startup specializes in e-commerce fulfillment and logistics. Delhivery plans to scale up the territories it covers in India, while expanding its end-to-end supply chain business to enterprises and small to medium-size businesses with the new funding. Another startup in India, the Ola ride-hailing company, raised $300 million from Hyundai Motor Group and Kia Motors. This brings its total private funding to $3.8 billion, according to Crunchbase. In addition, the company’s electric vehicle spinout, Ola Electric Mobility, in late February raised $56.4 million on its own, a funding round led by Tiger Global and Matrix India, previously Ola backers. Ola will collaborate with the automotive companies on developing EVs specifically for use in India. Back in the United States, Magnitude Software of Austin, Texas, received $179 million from 3i Group, an international private equity and infrastructure investment management firm. Magnitude’s specialty is unified application data management software. The company has more than 1,400 customers, including half of the Fortune 100. It competes with Oracle and SAP in the enterprise resource planning ecosystem. Chris Ney, Magnitude’s founder, chairman, and CEO, will retain a significant equity stake in the company. France’s Doctolib raised €150 million (nearly $170 million) in Series E funding led by General Atlantic, with participation by existing investors Accel, Eurazeo, Kernel, and Bpifrance. Paris-based Doctolib now has a post-money valuation of €1 billion, or more than $1.1 billion. The company offers a service for making appointments with doctors. It is extending that service to hospitals, while also expanding its geographic reach within Europe. The newest offering is a telemedicine service, allowing practitioners to “see” patients who are remotely located from their offices. San Francisco-based Cloudflare received $150 million in Series E funding led by Franklin Templeton Investments. This round brings its total private funding to $332.1 million, per Crunchbase. The company, which has offices around the world, is best known for its content delivery network, and it has branched out into Web performance and security—privacy services, too. Over to Israel—Innoviz Technologies, a developer of high-performance solid-state LiDAR sensors and perception software, raised $132 million in Series C funding. New investors in the startup include China Merchants Capital, Shenzhen Capital Group, and New Alliance Capital. Harel Insurance Investments and Financial Services and Phoenix Insurance Company, both Israeli institutional investors, also participated in the new round, which Innoviz is keeping open due to demand from other investors. Finally, among the really big-bucks investments, Source Photonics of West Hills, Calif., received more than $100 million to continue developing and supplying optical transceivers for 5G wireless networks and data centers. The company said only that the money came from “new financial and strategic investors.” In January of 2017, Francisco Partners completed the sale of Source Photonics to a private equity consortium led by Redview Capital and Asia-IO, with participation by TR Capital, Axion Asia, and Aberdeen Asset Management. Among other substantial investments in March was $88 million granted to Tarana Wireless of Santa Clara, Calif., a provider of fixed wireless access network offerings. Khosla Ventures, EchoStar, and existing investor 1010 Holdings put in the money. Watertown, Mass.-based Markforged, a manufacturer of industrial 3D printers, raised $82 million in Series D funding led by Summit Partners and joined by Matrix Partners, M12 (the Microsoft venture fund), Next47, and Porsche. Vast Data of New York received $80 million in Series A and Series B funding from Norwest Venture Partners, Dell Technologies Capital, 83 North Venture Capital, Goldman Sachs, and TPG Growth. It is a data-storage architecture start-up. San Mateo, Calif.-based Medallia raised up to $70 million in Series F funding. Sequoia Capital has been the company’s lead investor over the years. The startup offers the Medallia Experience Cloud, a customer experience management platform. Medallia is widely expected to join the parade of tech “unicorns” (it is valued at $2.4 billion) with initial public offerings in 2019. Mirakl of Paris, France, received $70 million in Series C funding led by Bain Capital, with participation by existing investors 83North, Felix Capital, and Elaia Partners. Its total private funding is $93 million, according to Crunchbase. Investors were captivated by cybersecurity startups in March, continuing a trend from 2018 and early 2019. Juniper Research estimates cybercrime will cost businesses more than $2 trillion this year. Contrast Security of Los Altos, Calif., raised $65 million in an oversubscribed Series D round of funding led by Warburg Pincus, with participation by Battery Ventures, General Catalyst, M12, AXA Venture Partners, and Acero Capital. Contrast offers what it calls “binary instrumentation”—agents embedded within application servers, runtime and user libraries, controllers, and data layers across Web browsers, mobile clients, containers, and frameworks. Paris-based Shift Technology received $60 million in Series C funding led by Bessemer Venture Partners, joined by Accel, General Catalyst, Iris Capital, and Elaia Partners. Shift specializes in detecting fraudulent insurance claims, and has 70 insurance companies around the world as its customers. Cambridge, Ontario-based eSentire raised $47 million in a private equity investment round led by Warburg Pincus, the majority investor, and by minority investors Georgian Partners and Edison Partners. The cybersecurity startup is a managed detection and response company. Its total private funding is $86.2 million. Tessian of London, England, received €37 million (about $41.5 million) in Series B funding led by Sequoia Capital, with participation by Latitude and existing investors Balderton Capital, Accel, and LocalGlobe. Tessian provides endpoint detection, focusing on enterprise email, which can be probed with spear phishing and other types of cyberattacks. Atlanta-based Ionic Security raised $40 million in Series E funding led by JPMorgan Chase, joined by Google, Kleiner Perkins, GV, Icon Ventures, Meritech Capital, TechOperators, and TenEleven. The startup provides a data security platform. Socure of New York, which offers cloud-based identity verification and fraud prevention, received $30 million in Series C funding led by Scale Venture Partners, with participation by Commerce Ventures, Flint Capital, Two Sigma Ventures, Synchrony, and new investor Sorenson Capital. The startup employs machine learning technology in its offerings, and it has raised a total of $57.5 million in venture capital to date. Las Vegas-based NS8 raised $26 million in a venture round led by Edison Partners, joined by Sorenson Ventures, Lytical Ventures, TDF Ventures, and Hanna Ventures, among other investors. This startup fights online fraud with a software-as-a-service offering. NS8 has taken in a total of $39.9 million in private funding. Established in 2005, Bishop Fox of Tempe, Ariz., received $25 million in Series A funding from ForgePoint Capital. The company conducts penetration tests and provides security assessments. Austin, Texas-based SpyCloud raised $21 million in Series B funding led by M12, with participation by new investor Altos Ventures and existing investors Silverton Partners and March Capital Partners. The startup provides a data breach detection service. Obsidian Security of Newport Beach, Calif., received $20 million in Series B funding led by Wing Venture Capital, joined by Greylock Partners, an existing investor, and GV. The startup, which offers a cyberidentity protection platform, was founded by executives who formerly worked at Carbon Black and Cylance (now BlackBerry Cylance). Obsidian’s total private funding is $29.5 million. CyberX makes its global headquarters in Waltham, Mass., near Boston. It raised $18 million in corporate funding led by Qualcomm Ventures and Inven Capital. Existing investors Norwest Venture Partners, Glilot Capital Partners, Flint Capital, and OurCrowd also participated. The Industrial Internet of Things and industrial control system security startup has received a total of more than $47 million. Other funded cybersecurity startups: Blue Cedar, $17 million, Series B; CB4, $16 million, Series B; RackTop Systems, $15 million, Series A; Mocana, $15 million, Series G; Cmd, $15 million, Series B; SentiLink, $14 million, Series A; Proxy, $13.6 million, Series A; Anitian, $11 million, Series A; Cymulate, $7.5 million, Series A; Sayata Labs, $6.5 million, seed round; and Sepio Systems, undisclosed amount. Automotive-related and mobility technology startups were also popular during March. In addition to Innoviz Technologies, San Francisco-based Ouster received $60 million in equity and debt funding from Runway Growth Capital, Silicon Valley Bank, and return backers Cox Enterprises, Constellation Tech Ventures, Carthona Capital, and Fontinalis Partners. Ouster also makes LiDAR sensors. Another San Francisco-based startup, Remix, raised $15 million in Series B funding led by Energy Impact Partners. The company provides a way for cities to plan public transit infrastructure. Brodmann17 of Tel Aviv, Israel, a developer of automotive computer vision technology, received $11 million in Series A funding led by OurCrowd, with participation by Maniv Mobility, AI Alliance, UL Ventures, Samsung NEXT, and the Sony Innovation Fund. The startup’s total private funding is $14.2 million. MotoRefi of Arlington, Va., raised $14.7 million in seed funding led by Accomplice, joined by QED Investors and Motley Fool Ventures. As you may guess from the company name, the startup is involved in auto refinancing. San Francisco-based Revvo (formerly known as IntelliTire) received $4 million in Series A funding led by Norwest Venture Partners, joined by VulcanCapital and AngelList. The startup makes smart sensors for vehicle tires. For all of March’s investment action, more plays are in the offing, according to news reports. Royole, a manufacturer of flexible displays in China, is trying to raise about $1 billion in advance of a planned IPO, according to Bloomberg. New York-based UiPath, a developer of robotic process automation software, wants to get more than $400 million in a new round, just months after raising $265 million in Series C funding. Mobvoi, a Chinese developer of human-machine interaction technologies, seeks to raise $100 million ahead of a public offering. San Diego-based Kyriba is in talks to receive $160 million to continue development of cloud treasury and financial management software. Nine-figure funding rounds were common in November. 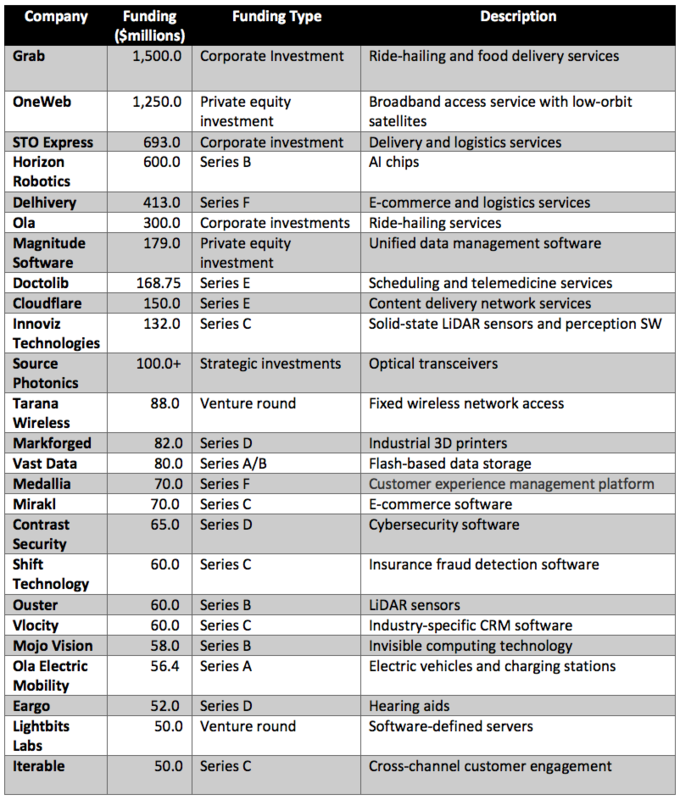 Funding flows to a variety of startups; M&A in security.